As leaders of this University, it is our responsibility to lead by example. We must challenge ourselves to be the university we all aspire to be and that the world needs us to be. Meliora is calling. This is an exciting time for the Rochester community. Tom Golisano has generously pledged $20 million to the University of Rochester Medical Center’s Golisano Children’s Hospital. This gift will help us raise the funds to build a hospital that will advance the care of children in Western New York and throughout the world. Benevolence of this magnitude demonstrates our opportunity to write the history of this community together. 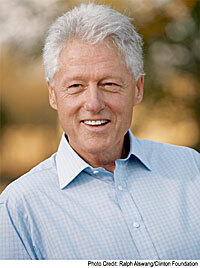 With Tom’s support we can become an example for posterity. Together, we are all the architects of this University, and it is our collective efforts that shape its future. On July 14, B. Thomas Golisano demonstrated his continued commitment to our region’s children with a $20 million pledge that will jumpstart the plans to build a new $134 million Golisano Children’s Hospital. The new hospital will include a 60-bed Neonatal Intensive Care Unit (NICU), pediatric imaging, and 56 private pediatric rooms. “Tom’s gift will transform the way that children are cared for in upstate New York and it advances our ability to modernize Golisano Children’s Hospital for the 21st century,” said President Joel Seligman. Tom Golisano’s original $14 million gift to name the Children’s Hospital in 2002 has helped URMC recruit outstanding faculty and expand programs in cardiac care, general surgery, neuromedicine, and more. This latest pledge brings Golisano’s total giving to the Children’s Hospital to $34 million, making him the University of Rochester’s most generous individual living donor. This gift provides the momentum to reach the goal of $134 million that will be used to create a facility matching the talent and dedication of the faculty, clinicians and service providers, enabling them to surpass the outstanding care they already provide. 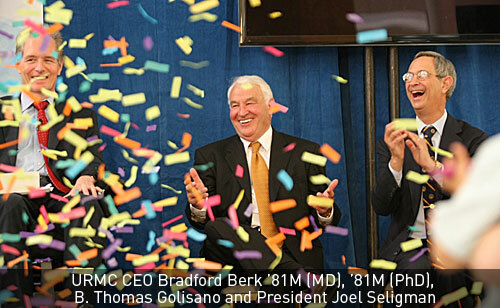 To read more about Tom Golisano’s gift commitment, click here. University Trustee Barry Florescue ’66 has contributed $5 million to the University’s newly created undergraduate business major. In recognition of the generous support and contributions Mr. Florescue has provided for the development of the major, it will be named the Barry Florescue Undergraduate Business Degree Program. 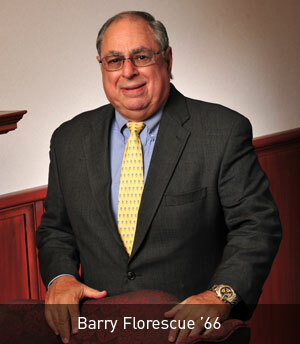 Barry Florescue is chairman of the board of BMD Management Company Inc., a member of the Simon School's Executive Advisory Committee, and a Charter Member of the George Eastman Circle. Through the Florescue Family Foundation Scholarship and the Florescue Fellowship Fund, he has helped both undergraduate and graduate students turn their aspirations of a University of Rochester education into a reality. “Let me express my gratitude to Barry for supporting a major that builds on the strengths of both the College and the Simon School and will provide a valued curricular choice for our undergraduates,” said President Joel Seligman. To read more about Barry Florescue’s gift, click here. Longtime supporters of entrepreneurship and education, Mark S. Ain ’67S (MBA) and Carolyn C. Ain have made a $3 million gift commitment to support entrepreneurship education and scholarships at the Simon Graduate School of Business. “Thanks to Mark and Carolyn’s generosity, we will be able to educate the George Eastmans and Bill Gates of the future and for that we are immensely grateful,” said Simon School Dean Mark Zupan. Recognized as an outstanding entrepreneur in New England, Mark Ain has played a key role in recent entrepreneurship initiatives at the Simon School. Since 2007, the Mark Ain Business Model Workshops and Competition has awarded winning students with $13,500 in cash prizes each year. Additional initiatives the Ains have supported include internship and scholarship support, a high profile lecture series through the University’s Center for Entrepreneurship, and technology transfer. His support has enabled students to contribute to economic development in the Rochester region through internships designed to bolster small businesses and the community. Mark Ain is an actively involved member of the University Board of Trustees, the Simon School Executive Advisory Committee, and a recipient of the Simon School’s 2005 Distinguished Alumnus Award. He is the co-founder and chairman of Kronos Incorporated, the market leader in the workforce management industry. 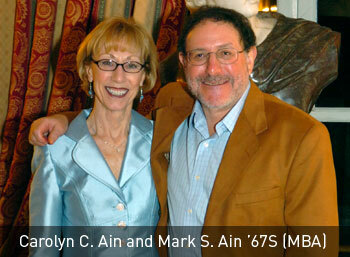 Mark and Carolyn are Charter Members of the George Eastman Circle. To read more about the Ains’ gift, click here. After listening to their friend Judy Wilmot Linehan describe the devastating effect of cancer on her family, and hearing Michael Donnelly’s incredible survival story thanks to the physicians and researchers at the James P. Wilmot Cancer Center, Philip and Marilyn Wehrheim ’61,’82 (MS) were inspired to make a $1.5 million commitment to fund the Philip and Marilyn Wehrheim Professorship. The Wehrheims, who are longtime supporters of many Rochester area charities and foundations, are strengthening the research efforts of the James P. Wilmot Cancer Center with this gift that will support Craig Jordan, Ph.D., the director of hematological translational research. “We were looking for something to benefit the community and we chose the Wilmot Cancer Center. Cancer has taken a lot of our friends. We wanted to keep talented researchers in our community,” said Marilyn, who earned her undergraduate and graduate degrees at the University of Rochester. This is not the first time that the couple was affected by patient testimonials. At the 2008 Discovery Ball, Philip and Marilyn were particularly moved by President Joel Seligman’s personal account of his successful battle with lymphoma. The result was a $250,000 commitment that helped fund the construction of the Wilmot Cancer Center, and the research within it. They also are Charter Members of the George Eastman Circle, directing their support to the Wilmot Cancer Center. An endowed professorship is one of the highest honors bestowed by the academic community, and it plays a critical role in recognizing and recruiting faculty and researchers. The Philip and Marilyn Wehrheim Professorship will support top scientists who are on the leading edge of cancer research. 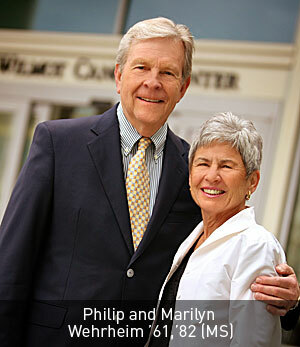 To read more about the Philip and Marilyn Wehrheim Professorship, click here. Eastman Dental alumnus and Midland Management President Jack W. Howitt, AB, DDS is a catalyst in the evolution of the Eastman Institute for Oral Health. Since earning his bachelor’s degree from the University of Rochester in 1956, and completing his pediatric dentistry training at Eastman Dental in 1962, he has been a teacher, leader, and champion of health for the Rochester community. 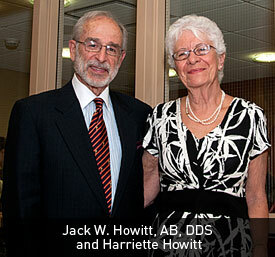 This year, Dr. Howitt continued his service and made one of the largest individual gifts in Eastman Dental’s history, to the newly named Howitt Urgent Dental Care Clinic. In the 1960s, Dr. Howitt helped to design, establish and direct Eastman’s signature SMILEmobile program, which has become a nationwide model, and which has served thousands of children. Since the 1990s, there have been increased demands to treat dental emergencies in the Rochester community. In response, the Eastman Institute for Oral Health built the Howitt Urgent Dental Care clinic and upgraded the Eastman Dental facilities during a two-year, $5.9 million renovation and re-engineering project. For more information on the Eastman Institute for Oral Health and Howitt Urgent Dental Care, click here. 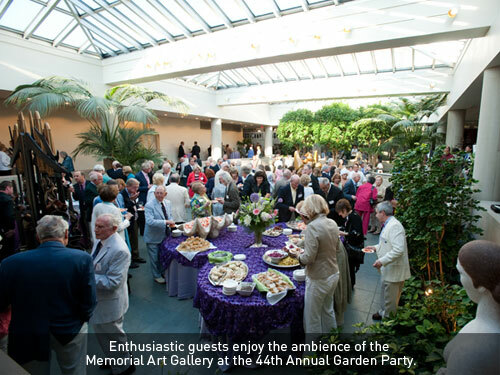 President Seligman addressed a crowd of more than 600 guests at the 44th Annual Garden Party on June 6, 2011. His keynote remarks entitled, “The University and the Community,” began by describing the 1924 campaign that elevated the University of Rochester to national prominence within a single decade. An inspiring vision, more than 13,000 contributions, lead donors, and volunteer leadership all rallied behind the campaign’s slogan of Ten Million in Ten Days. Time has marched on, and the University has built upon these foundations to remain true to its motto, Meliora, “ever better.” President Seligman noted his pride in being associated with one of the greatest faculties of any research university in this country. More than 40 students and faculty were highlighted for their achievements and recognition by international organizations, national research institutions, and the President of the United States. President Seligman pointed particularly to the work to expand the Wilmot Cancer Center and Golisano Children’s Hospital to better serve the needs of this community. “We envision a University whose quality has fortified its place among the leading twenty research universities in this country,” remarked Seligman. For a photo gallery of the 2011 Garden Party, click here. For the complete transcript of President Seligman’s address, click here. It may be hard to believe, but Meliora Weekend is right around the corner! This year is shaping up to be the most momentous yet with more than 200 programs and events including a Keynote Address by President Bill Clinton; our Saturday night, campus-wide event celebrating the spirit of Meliora; and Supreme Court Justice Antonin Scalia appearing in our annual presidential symposium. Please visit our Web site, learn more about this year's programs, and set up your registration account in advance. In addition, be sure to watch your mail this month for Meliora Weekend registration materials. We look forward to welcoming you back to campus this fall to celebrate this beloved Rochester tradition. For additional information visit www.rochester.edu/melioraweekend. Fast Forward is published by the University of Rochester, Department of Advancement Communications. For information about submitting articles, please contact advcomm@mail.rochester.edu.